You could spend a whole weekend walking around Montjuïc and not see everything there is to see. Of course there are the museums, the Olympic stadium and swimming pool, Montjuïc castle and the frankly underwhelming Poble Espanyol. But there are also a number of individual parks within Montjuïc itself that are all worth a visit. One that is tucked away on the eastern side facing the sea is the Jardins de Mossèn Costa i Llobera, named after the 19th century Catalan poet, Miguel Costa i Llobera, it is also known as the Cactus Park. This garden of succulents and semi-tropical plants perched on the steep side of Montjuïc below the Hotel Miramar, is a perfect place to escape the city, although you do get a certain degree of noise from the port and Ronda del Litoral below. The park is 3.6 hectares and is actually much bigger than you imagine when entering. I have no idea how many species of cactus there are but there are definitely some I’ve never seen before. An impressive array of species to be sure. Paths run parallel to the side of the hill with small steps joining the different sections. The location of the park, protected by Montjuïc, and facing the south-east means the park has its own micro-climate enabling plants to thrive here that would not in any other part of Barcelona. At one end of the park there is a long overgrown pergola with benches where you can sit and take it all in. It really is a lovely spot and when we went, there was hardly anyone there. 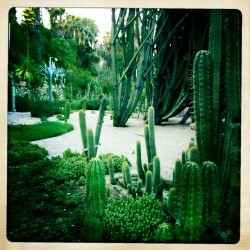 The cactus park is on Carretera de Miramar, next to Plaça de l’Armada around the front of the Hotel Miramar. It’s free, and open from 10am until sunset. There are a number of ways to get to it. You can take the funicular from Paral.lel and walk down from there. Get the cable car from Barceloneta up to the Miramar. And there are buses that can take you up there too. Or of course you can walk. 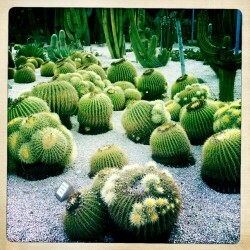 You can read more about the cactus park on the BCN.cat website. 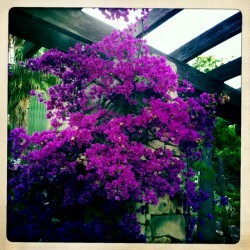 There is also another page on the site that explains the plants in more detail. I highly recommend you take the time to visit this park. Especially if you’re fond of the odd succulent or three. Great piece about the cactus park. I really enjoyed it. But I didn’t find Poble Espanyol underwhelming. It was kind of cute, and for people that don’t have time to travel in Spain and see all the different kinds of architecture across the country, it’s not such a bad thing. Agreed. It was busy. And I was possibly a little bit grumpy that day. I should go back. No Rob, you are right about Poble Espanyol.